Under no circumstances should you ever see water around the indoor unit. This is a sign that something is either dripping, leaking, or not draining. But don't panic, sometimes it can be a very minor problem. In the cooling mode, the indoor evaporator coil and the suction line (the large copper refrigerant line in black insulation) sweats. That is part of the purpose of the black insulation (armaflex), to keep the condensation from dripping. Sometimes if the insulation is missing or if it has open seems, it can cause dripping and obviously this is an easy fix. All armaflex joints should be butted-up tight and well taped. The evaporator produces a lot of condensation (water) during the summer, which runs down the coil into a pan, then out to the drain. The drain goes either into the ground, outside the house, or into a condensate pump. Then in turn, the pump takes the water either outside the house or into a plumbing drain. If the coil is dirty, then the water, instead of running down the coil, will hit the dirt, then drip onto the floor. This is one reason why the coil should be cleaned annually, not to mention for efficiency reasons. Now if the coil is dirty, the water will mix with the dirt and the dirt will end up in the pan, and it will end up in the drain, the drain trap, and anywhere else it can cause a problem. 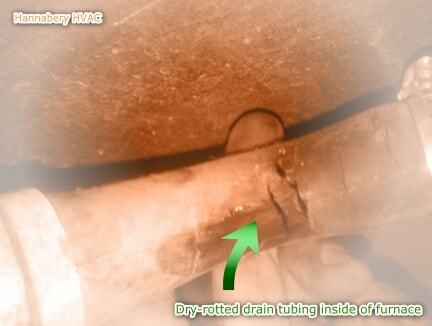 The bottom of the trap is the most common source of a clog and it can be cleaned out with a long flexible cleaning brush and flushing water down the cleanout cap. Keep in mind, it doesn't take much dirt to clog a drain. And if your unit is in an attic or a finished basement, this can cause terrible damage. This is another reason why it is important to always have a good, clean, properly sized air filter, along with having annual inspections. Sometimes the indoor coil can actually ice-up. And when the ice eventually melts, it drips onto the floor. Like water, you should never see ice anywhere on your system during the cooling season. Indoor water problems aren't only during the summer. Many of today's high efficiency furnaces produce condensate as well. They also have to drain the water. There are many parts in the furnace that can leak, drip, or crack, causing a water leak. And along with the furnace comes the central humidifier, which can also be a source for leaks. 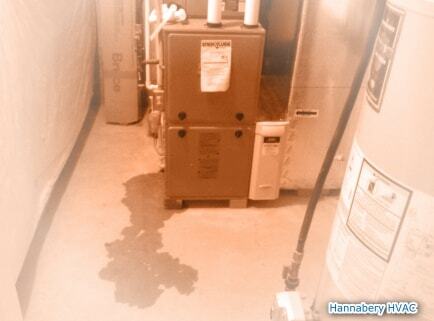 Furnaces and humidifiers need to be cleaned and serviced annually. So keep your eyes open... If you see water, try to trace where it is coming from. Sometimes it's a simple fix - sometimes not.